Looking for Discount Disney Tickets? We work with Disney's most trusted travel partner to provide exclusive prices for our readers. Get Discount Disney Tickets Exclusively Through Mickey Visit. We only send you the best Disney related content and special offers. Check out our destination homepage for all discounts, tips, and planning guides for Disneyland in California! Take advantage of exclusive Mickey Visit discounts to save on your next Disney vacation. Pick the best time of year for your Disneyland vacation! Info on every month and holiday. Book before these prices are gone forever. Save hundreds. Disneyland Halloween Guide: Decorations, Food, and Special Events! Disneyland Halloween Time, with special themed attractions, delicious autumn food, and Disney Halloween park decorations, is one of the most fun times of year at Disneyland. The Disneyland Halloween 2019 season will run from September 6th through October 31st. The entire Disneyland Resort is decorated for Halloween including special park decorations and overlayed attractions with Disneyland Halloween themes. Also, during this time the popular separate ticket, Mickey’s Halloween Party takes place on select nights. You can see information on the Halloween Party here. Disney California Adventure park has continued to expand their offerings to provide even more great Disneyland Halloween experiences. The decorations in both parks are impressive now that California Adventure has caught up with the Halloween fun with Cars Land and Buena Vista Street decked out in its spooky glory. The 2019 Halloween season will bring a new party to Disney’s California Adventure: Oogie Boogie Bash! Now, there are fantastic offerings in both Disneyland and Disney California Adventure park. Check out my list of the top 13 Disneyland Halloween Experiences You Can’t Miss and my review and photos of the new Disneyland Halloween in Disney California Adventure. In the article below, I will break down all of the Disneyland Halloween festivities happening throughout the Disneyland Resort and provide advice on how to maximize your time during the Halloween season. Be sure to check the official Disneyland website for full information on Halloween at Disneyland. Get exclusive access to prices on hotel & tickets just for Mickey Visit subscribers. Don't miss our travel hacks newsletter! Disneyland Park transforms two popular attractions for Halloween Time. Both Space Mountain and the Haunted Mansion are totally decorated and changed over for the Disneyland Halloween season. The one disappointment with the overlay is that because the Haunted Mansion Holiday runs from September-January, the classic Haunted Mansion attraction is only available for six months out of the year– which is bemoaned by some Disney fans. When the Haunted Mansion Holiday rolls into town, the lines balloon to have multi-hour waits. You can avoid these lines by getting a FastPass for the attraction or heading here early in the day. Space Mountain becomes Space Mountain: Ghost Galaxy during Halloween Time. This overlay is created using new projection effects and a spooky soundtrack onboard the roller coaster. The rides regular feeling of optimistic space exploration transforms to focus on a darker and more menacing theme. Plenty of people come out screaming from this more intense ghost infested space rollercoaster. While the ride is fantastic for teens and up, this may not be the time to bring young children on Space Mountain, especially if it is their first time riding. The same way that we always recommend enjoying Space Mountain first in our Disneyland touring advice, you should really be rushing to Space Mountain: Ghost Galaxy. Even during regular season, this is one of the most popular attractions at Disneyland. Imagine what making the attraction one of the headlining pieces of the Disneyland Halloween season does. Suffice to say, arrive here early and get a FastPass or the new Disneyland MaxPass if you want to ride the attraction any other time during the day. In Disney California Adventure park, Cars Land, Buena Vista Street, and Guardians of the Galaxy – Mission: Breakout! will all transform for the holiday. Cars Land will celebrate “Haul-O-Ween” with awesome overlays and decorations everywhere. You can see photos from Cars Land at Halloween here. They explain that from “Fillmore’s Jack-Oil Lanterns and Flo’s Spider-Car to Witchy Miss Lizzie’s shop” each and every location will be transformed to better celebrate Halloween in Disneyland and to transform Radiator Springs into Radiator Screams. Also, Mater’s Junkyard Jamboree will become Mater’s Graveyard JamBOOree and Luigi’s Rollickin’ Roadsters will change into Luigi’s Honkin’ Haul-O-Ween. Buena Vista Street (plus the entrance to the theme park) will receive new Halloween decor inspired by The Nightmare Before Christmas film. Oogie Boogie has taken over Disney California Adventure as his oversized silhouette beckons guests down the street and a swarm of bats swirl around Carthay Circle Theater. The Headless Horseman sits at the top of the street serving as an ominous beacon and fantastic photo location. This was nearly impossible to photograph well, so I had to borrow a photo. Finally, Guardians of the Galaxy-Mission: Breakout! becomes Guardians of the Galaxy-Monsters After Dark starting at 6 pm everyday. This special Halloween version of the attraction is a scarier version that does not include the popular song soundtrack of the regular version of the attraction. Instead, Monsters After Dark picks up where the main Mission: Breakout story leaves off. The attraction centers around your car serving as bait to distract the monsters–which have inconveniently been released from their cages–from eating Baby Groot. You will want to get a FastPass which is distributed starting at 3 pm each day in person and in the MaxPass app. The lines for this special nighttime experience will be long, so you will really want to have the FastPass. The popularity of the Halloween season at Disneyland has only increased. Each year, more and more people schedule vacations during this time period. This has taken this time period, which was once an off season, and created another time period with incredibly high room rates. I set up an exclusive deal with one of Disneyland’s longest travel partners to provide my readers (that’s you) the lowest priced Disneyland tickets anywhere on the web. Also, I pushed them to give me special prices on Disneyland packages for the September and October Halloween months.Check out the special Disneyland packages and ticket prices for more information on how to save during your Disneyland Halloween vacation. Upon first entering Disneyland park, huge Disney character pumpkins adorn the ticket booths and greet you as you step into Disneyland Park. The large Mickey Mouse floral arrangement will be completely done in a darker Halloween theme. Then, once you arrive on Main Street U.S.A. you’ll see pumpkins and orange bunting adorning every building. It seems that every pumpkin is unique in shape and size. This really adds to the fall feeling in the park. The Main Street decorations are capped off by a huge Mickey Mouse pumpkin that is perfect for photos. There are long lines for a photo at the beginning and end of the day when mass amounts of people are coming and going. Don’t waste your precious morning time when you could be getting a Disneyland FastPass or your tired evening time when you should be going to bed. Take your picture with the Mickey Mouse pumpkin head sometime in the late morning or afternoon. A perfect time is when you are crossing between parks using your Disneyland Park Hopper ticket (discounted here). In Frontierland, the decorations feel much more unique and provide a very special charm and three dimensional level of detail I expect in anything Disneyland does. When you first enter the land, next door to the Golden Horseshoe you can find The Halloween Tree, dedicated to Ray Bradbury and his book with the same title. Ray Bradbury has an important place in Disney history because of his work on EPCOT Center in Walt Disney World, his friendship with Walt Disney, and insightful observations on Disneyland. Ray Bradbury’s writings on Disneyland are extremely prolific and a quote from his work even serves as the forward into my book on Disneyland Secrets. Further into Frontierland near one of my favorite Disneyland Restaurants, Rancho Del Zocalo, are beautiful decorations honoring Dia de Los Muertos, or day of the dead. As for specific Disneyland Halloween characters, over by the Haunted Mansion Holiday, Jack Skellington and Sally are often out for a special holiday meet and greet. Also, Mickey Mouse and Minnie Mouse often wear their Halloween costumes the entire day. Beyond these characters, you never know which Halloween specific people you will see wandering the parks. In the past popular Disney villains like Maleficent, Captain Hook, Cruella de Ville, and more have been spotted wandering Main Street U.S.A. You can find specific information on characters each day in the official Disneyland app. There are more special decorations and specific Halloween Disney characters throughout the entire park during the separate ticket Mickey’s Halloween party on select nights throughout September and October. Just like the decorations and ride overlays, the snack offerings during the Halloween season are transformed. The Disney culinary team outdoes itself every year as they work out new sweet treats to be sold throughout the resort. If you can dream up a bakery good, you can probably buy that good in pumpkin flavor at Disneyland during Halloween Time. If you are looking for these sweet treats, look specifically at the Pooh’s Corner shop in Critter Country, Candy Palace on Main Street, Trolley Treats on Buena Vista Street in Disney California Adventure, and if you are outside the parks you can find treats at Marceline’s Confectionery in Downtown Disney. There are so many treats that is hard to provide up to date information on these important addition to the Disneyland Halloween celebration. When you visit, be sure to look at all of the selection for seasonal dessert as not to miss one of the new Halloween specific creations. Make sure to read all about Halloween themed treats in our yearly updated guide to Halloween food at Disneyland. NEW: This 2019 Halloween season, Mickey’s Halloween Party will take a year off as Disney California Adventure hosts the Halloween festivities! Scroll down to read all about the new Oogie Boogie Bash coming to California Adventure which will feature similar villainous characters as Mickey’s Halloween Party hosted in the past along with the popular Frightfully Fun Parade. Mickey’s Halloween Party takes place at Disneyland and is a special Halloween themed event held in September and October in conjunction with the Disneyland Halloween season. The party consists of fun entertainment, attractions, and candy, all while you wear your Halloween costume inside Disneyland Park at the Disneyland Resort. Click here to learn more about Disneyland Mickey’s Halloween party.Disneyland Halloween 2018 season. The events typically run from 6pm or 7pm until 11pm or 12pm. With the purchase of a ticket to the Halloween party, you can enter the park up to three hours before the party begins. At the time of the party, every non-Halloween party guest who doesn’t have a wristband given to all event attendees will be ushered out of Disneyland. This is an important point for all guests visiting during September and October: If you don’t have a park hopper ticket then you will be forced to leave Disneyland early in the evening and have nowhere to go but back to your hotel or home. Be sure to check the Mickey’s Halloween Party dates to see if they conflict with your Halloween trip. The Disneyland Mickey’s Halloween Party event centers around special entertainment fireworks and a character cavalcade, which, this year, will be headed off, by the headless horseman (see that pun I worked in there). The main draw for the event is the popular Halloween-Screams fireworks, which worked in impressive projection on the castle years before the debut of the Disneyland Forever fireworks. Another highlight of the event for park guests are the various Halloween trick-or-treat trails located throughout Disneyland. These provide Disneyland guests the opportunity to receive huge amounts of candy. The tickets for the event can be pricey and I really don’t recommend purchasing both a park ticket and event ticket in the same day. If you like the sounds of the party, then consider not purchasing a park ticket for that day and enjoying yourself at the hotel or in Downtown Disney until you are allowed to enter the park with the ticket. Even with our exclusive discounted Disneyland tickets, purchasing both the Mickey’s Halloween party ticket and regular park ticket seem costly. Read all about the Disneyland Mickey’s Halloween party information here. This NEW event coming to California Adventure this Halloween season will be a separate-ticket party event at Disney’s California Adventure park featuring a new World of Color show, an interactive dance party, stage shows with Mickey, and Disney villains walk-through experiences. 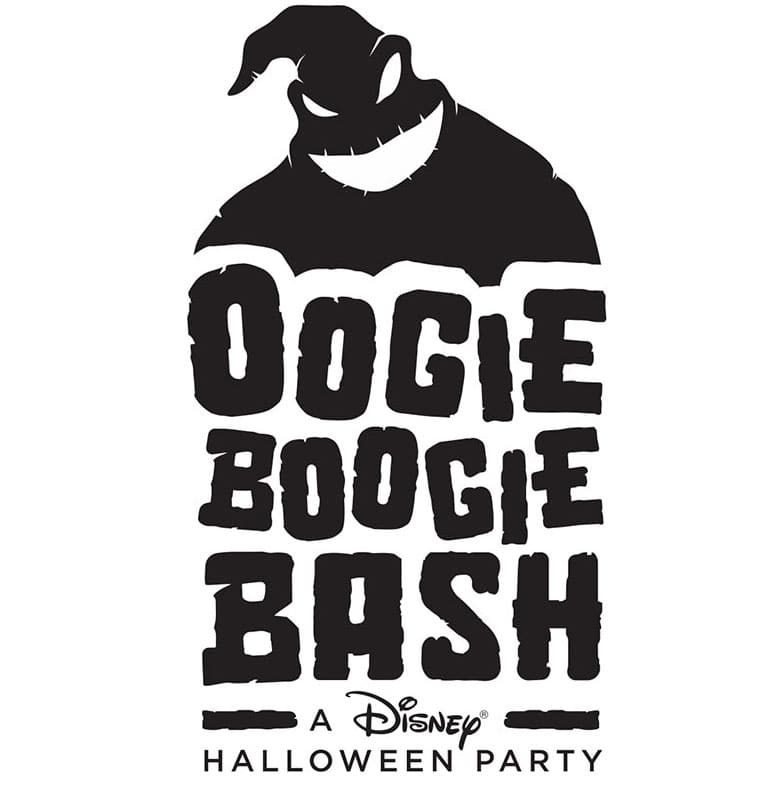 Oogie Boogie Bash will take place from Sept. 6 through Oct. 31, 2019. The Frightfully Fun Parade will come to California Adventure this Halloween season! Entry to Disney California Adventure park before the party is included with an Oogie Boogie Bash ticket. The after-hours party begins at 7 p.m. PST and you will have the opportunity to play in the park for three hours before the event starts on Tuesday and Thursday nights (excluding Oct. 29 and Oct. 31) or four hours on Sunday nights, plus Oct. 29 and Oct. 31. This is an important point for all guests visiting during September and October: If you don’t have a park hopper ticket then you will be forced to leave California Adventure early in the evening and have nowhere to go but back to your hotel or home. “Villainous!” –This new “World of Color” show tells a Halloween Tale about a young girl named Shelley Marie as she goes on a journey exploring the villainous side of Disney characters. Immersive Treat Trails – Trick-or-treating is coming to California Adventure with new wicked treat trails with iconic characters such as the Mad Hatter or Oogie Boogie surprising guests. Additional treat trails will feature oversized cauldrons full of treats for all guests to enjoy. DescenDance –This dance party will take place in the Backlot area of Hollywood Land and is inspired by the “Descendants” franchise from the Disney Channel featuring the biggest hit songs from the films. “Frightfully Fun Parade” – This well loved parade is coming to California Adventure for the first team led by the Headless Horseman of Sleepy Hollow followed by Mickey and Minnie leading a cavalcade of characters and Disney villains. Mickey’s Trick and Treat show – This interactive stage production is great for younger guests as guests join Mickey and his friends as they throw a Halloween party. Featuring dancing, not-so-frightening tales, and candy at the Disney Theater in Hollywood Land. Character encounters – Meet a variety of Disney characters and villains! Stay tuned as we will update this page with tips, tricks, and information. This event will likely be similar to what we have seen offered at Mickey’s Halloween Party at Disneyland in the past but this time with a new Oogie Boogie themed twist as it moves over to Disney’s California Adventure! 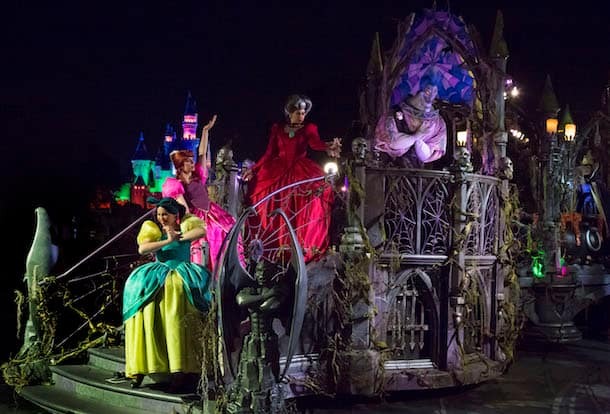 During Halloween Time at Disneyland, a specific “Happiest Haunts Tour” is held that focuses around the specific Halloween attractions and story of certain Halloween elements in the park. Last year, the tour centered around a Halloween quest to find Aladdin’s missing magic lamp. Over the course of the search, the tour guide took guests on six attractions throughout the entire park. Tour benefits can change year to year, but in the past these Halloween tours have included front of the line access to the two Halloween themed attractions, plus some of the other top attractions throughout the park. Also, in previous years the tour has included two Halloween desserts and an exclusive pin. 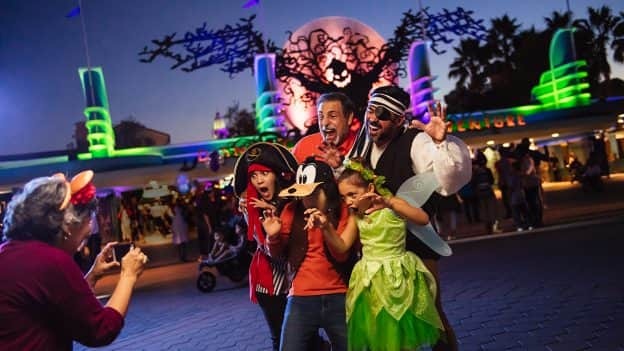 This tour, not to be confused with the Disneyland VIP tour guides, provides a nice fun way to see all of the Halloween offerings and a fun interactive story that kids will really enjoy. The tour is pricey, costing $99 in addition to purchasing theme park admission. You can find out more information on the Disneyland Halloween Happiest Haunts Tour on the official website. Click the links below for more planning information beyond Disneyland Halloween. You can find all of the most current official information on the Disneyland Halloween season on the Halloween Time at Disneyland page on the Disneyland website. Disclosure: We have used all the products recommended on Mickey Visit. We may receive compensation when you click on links to some products featured. Get exclusive Disney deals, the latest vacation tips, and more! Browse our most useful Disney guides and get insider tips and tricks. Book before these prices are gone forever. Walt Disney World vs. Disneyland- Which Choice is Best for Your Family?